If there is one plane that has sleek lines, it is the Lockheed Constellation, built in various variants: L-049, L-649, L-649A, L-749, 1049 and the Super Constellations L-1049C, L-1049E, L-1049G, L-1049H & L-1649A; fortunately there are still a few Connies around, although for commercial use their days are over. of its former military role (a lot of the equipment in the cabin has been taken out, to save weight). "It was operated as a bar restaurant for about a year. 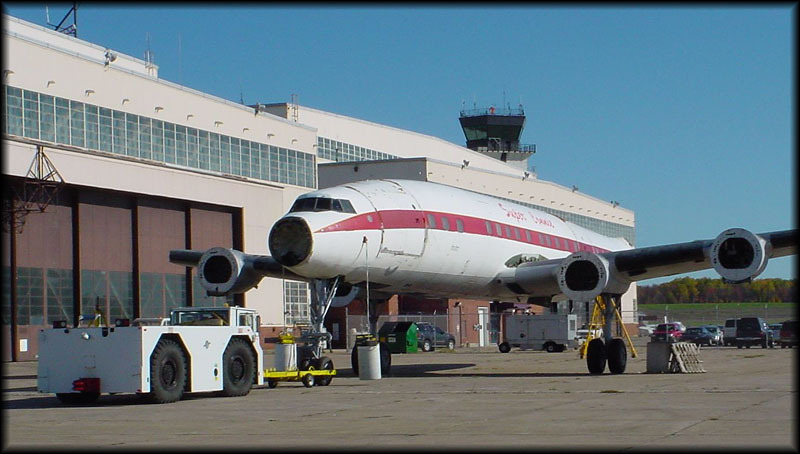 It's been for sale for at least 3 years and appears to be abandoned (rumor has it Boeing's "Museum of Flight" in Seattle,WA may have bought it... I'm waiting for confirmation from them on that). Anyway, if it still is for sale, the last price the real estate agent told me was "best offer around one hundred thousand Canadian dollars". "I have pleaded with Air Canada and every major museum to consider this bird...but nobody seems interested. Now the owner seems to have abandoned it...hopefully the rumor that the boys in Seattle bought it is true!" Thanks Mike ! The Curator of the Museum of Flight confirmed to me, in early Jan.2003, that an attempt to purchase this aircraft had failed and that the owner was looking for a place to store it. In July 2004 it was offered for sale on eBay, not so strange unless you consider the fact that Greater Toronto Airport Authority (GTAA) considered themselves the owners of the plane (and they did not put it up for sale on eBay) and GTAA had promised to donate it to the Toronto Aerospace Museum (which did not know about the eBay auction either...). So who is this mysterious owner ? Well, that was (allegedly) one Catherine Ross. The engine cowlings are off, the props are stacked in the mud like giant jacks, and the tricky job of disassembling the wings is underway. 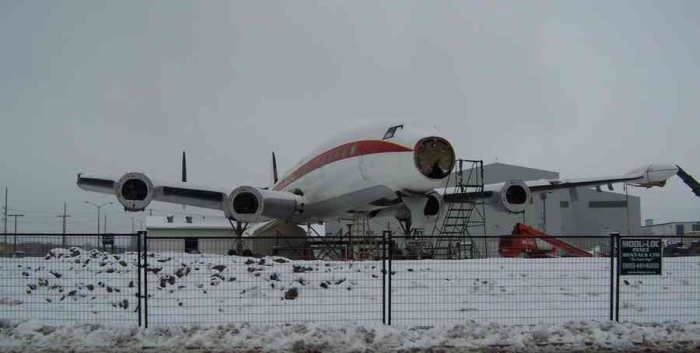 They are dismantling the rare "Super G" Constellation airliner, known for years as the diner "Super Connie," on Derry Rd. in Mississauga. Though this former luxury airliner hasn't flown in decades, it is the last surviving Lockheed "Super G" Constellation once owned by Trans-Canada Airlines (now Air Canada). 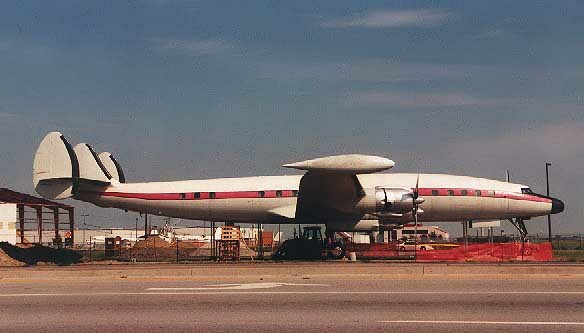 With its sweeping fuselage and distinctive triple tail, it carried passengers across North America and to Europe from 1954 until it was withdrawn from TCA service in 1962. Soon, it will be making its final long haul. First, to a nearby Air Canada hangar. And then, on a flatbed, to its new home in the United States. It's been purchased by the Museum of Flight in Seattle, Washington. "Air Canada has promised to paint it first before it comes here," said Dennis Parks, the museum's senior curator. "We're hoping to put it back in the original TCA colours." 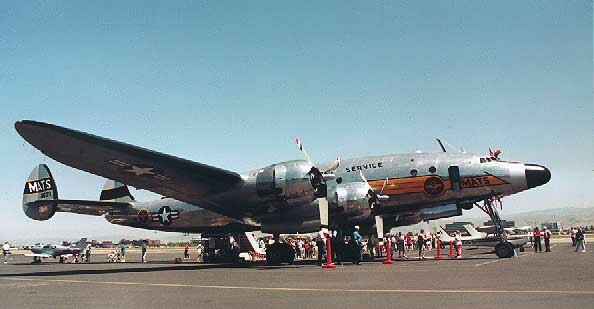 The Super Connie was scheduled to go on transport on 17Feb06 but this seems to be delayed. These photos were sent to me on the 16th and transport seems to be a long way off. "Here are some photos I took in 2002. 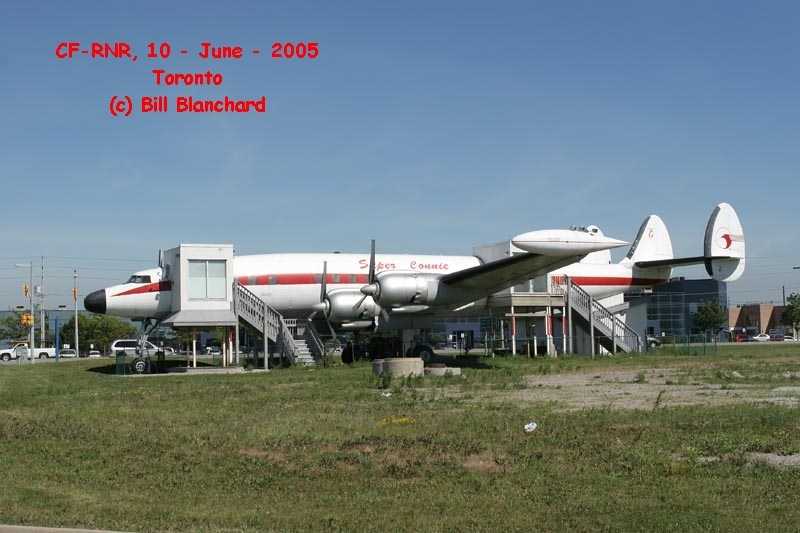 We were returning from a vacation and had to stage through Toronto, so I called some friends and we went for a drink in the Super Constellation CF-RNR, which at the time was parked just north of the airport. The first photo was taken just outside the entrance, sort of a porch so as to not impact on the interior of the Constellation. 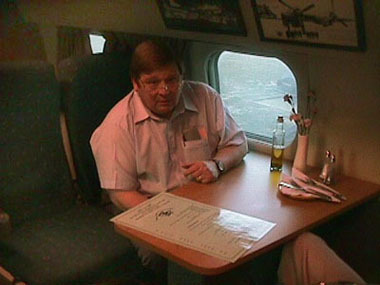 The 2nd picture was taken in the first class lounge. Interestingly this area was near the tail not the near cockpit as is today’s norm. I did visit the cockpit and was amazed at the amount and size of the radio equipment it carried when flying! Good thing we did the visit then as the Connie 'disappeared' a year later..."
The owner, Catherine Ross, claimed (during early 2006) she had been negotiating with Boeing for years and a deal had allready been done in 2002; that would make the eBay posting a little strange, but Mrs Ross did have an act that was hard to follow sometimes, I was told. During Feb.2006 the disassembly continued as can be seen on these photos by Den Pascoe: here and here. I was told that most of the parts have been moved to a storage yard on Torbram Road, about 1 km north of its previous display location on Derry Road. By 10Mar06 hardly anything was left in that spot. Bob Bogash is the Seattle Museum of Flight's volunteer project manager for the Toronto Super Constellation project. He has put together a very detailed and informative website relating to the facts surrounding the aircraft, as he sees them. A must-read for all those interested in this continuing saga. On 20Sep06 the Canadian Heritage Board in Ottawa was in session; the ruling concerning CF-RNR was that Boeing's appeal against refusal of the Export permit was dismissed. 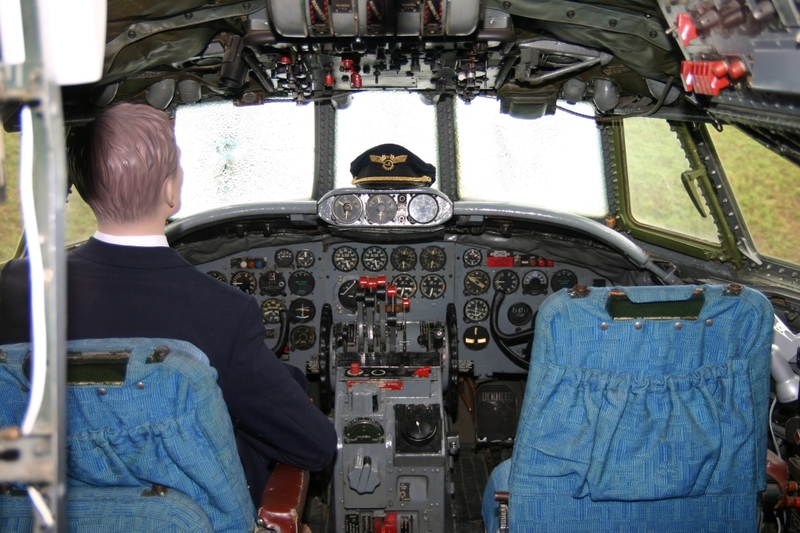 In february 2006 the Cultural Property Office of the Department of Canadian Heritage had ruled that, since CF-RNR had been classified a movable Canadian Cultural Property, such Export Permit was required if a purchase by the Boeing Museum of Flight was to take place. The Heritage Board will establish a "fair market price" for this vintage transport and Canadian parties can make an offer according to this market price. Boeing is the owner and they can hang on to it if they want and await the time when they are allowed to approach the Heritage Board again. Any Canadian parties interested in the purchase will not only have to consider the cost of purchase but also the cost of restoration and display. Meanwhile, CF-RNR lies dismantled at the Cargo Star truck parkinglot in Toronto. The next hearing on the export permit is scheduled to take place on 20Mar07. 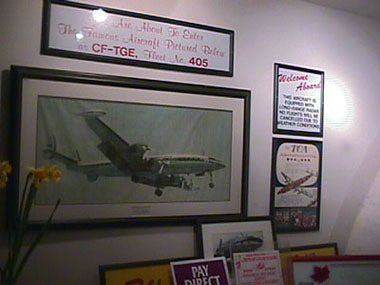 The Toronto Aerospace Museum held an appeal to keep "the Toronto Connie" in Canada . But at the end the bid fell short and CF-RNR / CF-TGE was cleared for transport to Boeing's Museum of Flight. 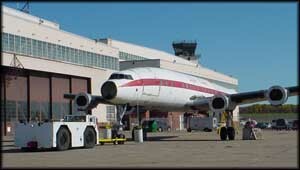 "The Museum of Flight's SuperG Constellation in now in the United States. It arrived last Thursday (June 07th) at Rome, NY where it will be re-furbished and put in its original TCA Markings before coming to Seattle. In Nov. 2007 I received following message concerning Lockheed L.1049G CF-TGE. Two 2 cranes cradled it and as of monday 29Oct07 the cranes are gone and it is now sitting on its own gear. More photos by Dave on my page Photos by Friends & Guests -page 11-. 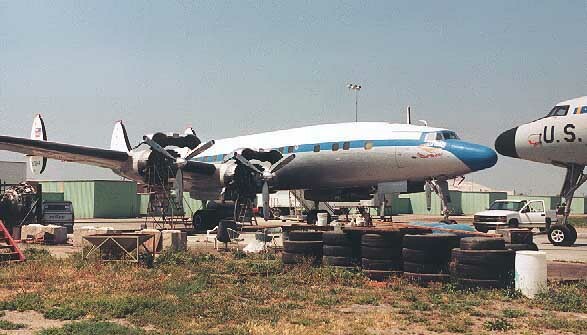 This ex/US Air Force 54-4062, ex/US Navy 131636 Constellation lost its future when the FAA banned certain type of aircraft from certain countries and HI-583CT was stored at Santa Domingo around 1994. It was bought by Super Constellation Flyers Association, a Suisse group interested in restoring a Lockheed Constellation. It was registered N105CF on 24Oct2000 and flown to Avra Valley,AZ for restoration in Jan.2001. Things did not quite go as planned and in the end parts of N105CF were used to restore another Connie for SCFA. You'll find an update there too, because it moved to a new owner late-2015! Fortunately, there are people who take preservation seriously: Vern Raburn's beautiful 'MATS Connie' (N494TW, cn2601 at San Jose,CA 1997). It's life at the air show circuit was cut short when it was sold in 2005 to Korean Airlines for static display in S.Korea. 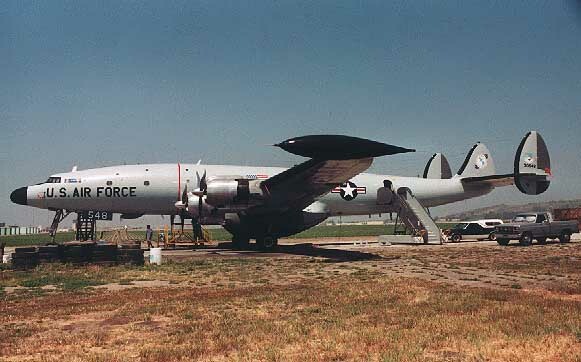 At Camarillo,CA I found not one but two Connies: EC-121T 53-0548 as well as this C-121C (L-1049F) N73544 (c/n 4175). Crew I spoke at this site were not too pleased with the handling characteristics of N73544. 'The Constellation Historical Society' (Benny Younesi) gave up on its restoration. N73544 became HB-RSC for the Super Constellation Flyers in Switzerland in 2004 and for many years was a welcome visitor to various air shows in Europe, though it was grounded for the 2010 season due corrosion of the wing; in April 2011 it was rolled out with new, slightly revised colourscheme. HB-RSC was grounded 2017 again due maintenance issues (wing flap rods, damage to wheels, brakes, et cetera) and when Breitling ceased its sponsorship the budget ran out. 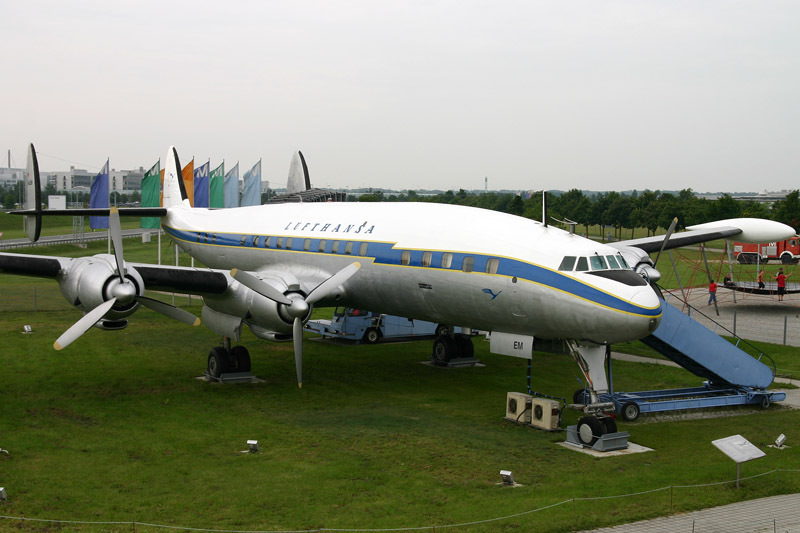 This is Lockheed L.1049G Super Constellation with maufacturer's serial number 4671, preserved at Munich's Franz Josef Strauss IAP, Germany (MUC/EDDM). I took this photo in the summer of 2005, it had to start raining of course. 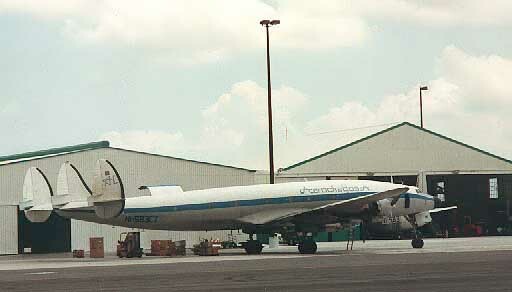 Background info to the "Connie", including comparisons to contemporary transports. Read of the arrival of N749NL "Dutch Connie" at Lelystad,NL on Sept.28th 2002: Connie's Comeback !